Netflix shares have risen slightly in the past week and are up 35 percent this year. They are the best performers of the FANG stocks. Miller Tabak equity strategist Matt Maley said the name could still have more room to run. The bullish golden cross forms when a shorter-term moving average crosses above a longer term. It signals the reversal of a downtrend. A golden cross formed March 11 on Netflix’s charts. “The last two times in 2015 and 2016, it saw a rally of 120 and 95 percent after they saw the golden crosses,” said Maley. “I’m not calling for that kind of a huge rally but history says it’s been a positive sign,” he said. Maley said the charts have a different story for Apple’s stock. 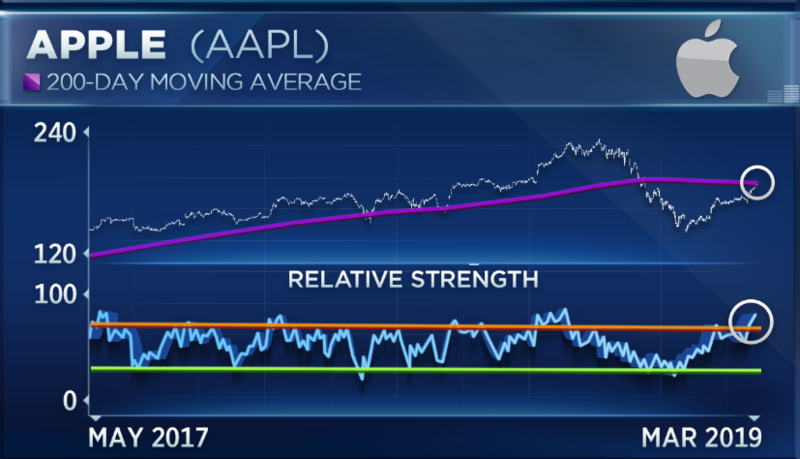 Apple is a 2 percent rally from its 200-day moving average. It has not traded above that trend line since November. “It will probably have to pull back, consolidate its gains, work off that overbought condition before it can rally further,” said Maley. Netflix may have difficulty continuing to grow as increased competition muscles its way into the space, said Gina Sanchez, CEO of Chantico Global. Netflix sales are expected to slow from 35 percent growth in 2018 to 24 percent by 2020. “You look at the average number of subscriptions that cord cutters have. You’re talking about three-plus subscriptions. Quite frankly, viewers are getting subscription fatigue. At some point you’re going to have to see some consolidation,” Sanchez said.